Actor and Steep Canyon Rangers banjo man Steve Martin has become a father for the very first time at the incredible age of 67. So far Martin hasn't made any statement regarding the birth of his first child, although back on February 11th he did send out a tweet that said "Coo coo, cutsy wootsy, footsy pie" so maybe that was baby talk for I'm a new dad, congrats to me. 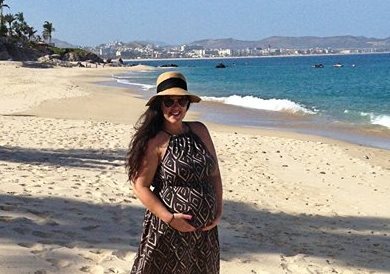 Krystal Keith took to the beach recently to reveal to fans in the cutest way whether she's having a boy or a girl. When will society accept openly that a man matures and a woman ages. Steve has matured well biologically and nature hasn’t shut down his ability to produce. His child will have all the love and care his parents are able to give him. The child will no longer be a child at around 20, at which time dad will be dad as loved as ever. Mum will be Mum. I doubt very much that the child will be looking at Dads age when Love is exchanged between them. i doubt either that the aspect of playing football with the child, or any other sport will come into it. How many fathers have done more than the odd time, it just doesn’t happen. Participation with the child doesn’t need to be displayed physically. Having older parents has its advantages, one that in the crucial early years of life, the child will probably receive more attention than a younger father would be able to find the time to give. its all a matter for personal consideration and choice, no input is needed from those who think they know best.